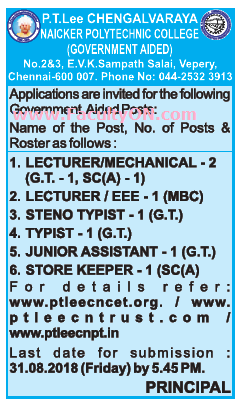 P.T.Lee Chengalvaraya Naicker Polytechnic College, Chennai has advertised in THE HINDU newspaper for the recruitment of Lecturers Plus Non-Faculty jobs vacancies. Interested and eligible job aspirants are requested to apply on or before 31st August 2018. Check out further more details below. About College: P.T. Lee. Chengalvaraya Naicker, the illustrious founder of this institution,was born in the year 1829. His father, Perumal Naicker, on whom the Government had conferred the title "Sirdar Bahadur", was a subedar-Major in the Madras Army. His mother Theivayanaiammal, towards whom her son showed a rare respect and devotion, was very pious, orthodox and conservative. Even as a child, Chengalvaraya Naicker was noted for his sweet nature, devotion to God and his parents, and kindness to all around him. As he grew up he developed a keen interest in business which led him to adopt trade and commerce as his profession. How to Apply: Interested and eligible candidates are requested to send their applications along with CV, copies of educational certificates and recent passport size photographs to the following postal address.